Hard to believe I have managed to pull off 100 posts! I find blogging a state of mind that I have learn to develop, which as most things comes in waves. 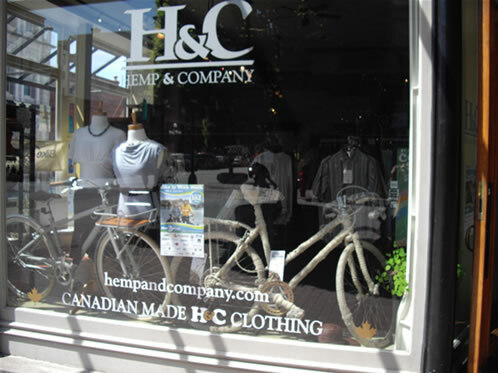 Spring is here and the sun and warmth has been spreading its energy into the store. We have been doing some spring cleaning and a small scale reno. Ryan and some good friends came in on Thursday night removed the change room, opening the store quite a bit. Our couch is now in a cozy little nook, and it was all done over night, in perfect time for our monthly social! Thanks to Joanna for bringing freshly picked strawberries to the social, they were little packages of yummy gold. 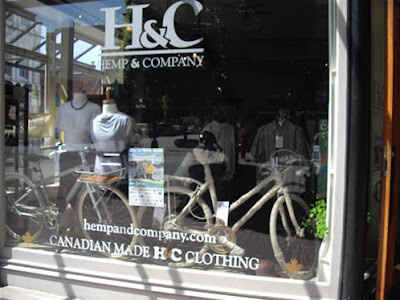 Another change, is out “Cozy ride” bike has taken a temporary residence at Hemp and Company on 1102 Government St. This has motivated us to bring out the felted bike and for Ryan to wrap a bike in Noro Silk Garden lite, it is gorgeous! Look for them the next time you are in!